Welcome to March, Belle of the Kitchen readers! I’m Carrie from Kenarry: Ideas for the Home back again for the latest installment of Ideas for the Kitchen. Once a month Ashlyn and I trade blogs to bring you new recipes and ideas for your kitchen. Both Ashlyn and I were born in the month of March. To celebrate, we thought it would be really fun to swap birthday dessert ideas this month. I’ve brought over a melt-in-your-mouth S’mores Chocolate Fudge Cake to share with you today. 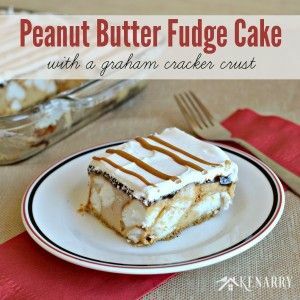 With graham cracker, toasted marshmallow and melted chocolate bars, it’s like having your favorite summer-time treat any time of the year. 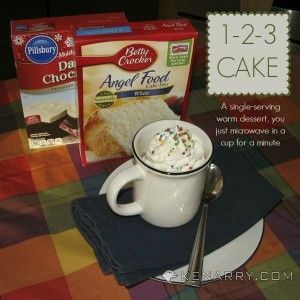 While I’m here, Ashlyn’s over at Kenarry: Ideas for the Home sharing a delicious recipe for Cake Batter Bars. 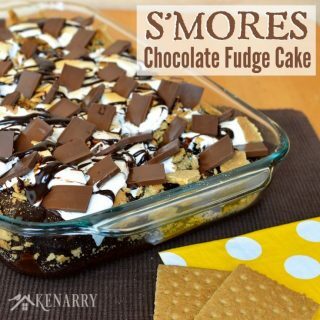 She’ll share it with you here in a few weeks, but if you’re anxious to try it sooner head over to Kenarry: Ideas for the Home and check it out. Are you the type of person who relishes the thought of your birthday and marking the start of a brand new year of life? Or are you the type who loathes it and would rather no one noticed? Personally, I’m not quite as bad as my sister who claims an entire birth-month to celebrate, but I do look forward to having a day once a year to feel special and reflect on who I’ve become and where my life is headed. This year, I’m officially reaching “mid-life” — the big 4-0! It’s not going to be black balloons, tombstones and over the hill stuff for me, though. I love celebrating birthdays with my family and prefer we mark this momentous occasion with bright colors, good cheer and of course, cake! The S’mores Chocolate Fudge Cake I’m sharing today was inspired by a “Campfire Cupcake” I had at a bakery in Chicago several years ago. 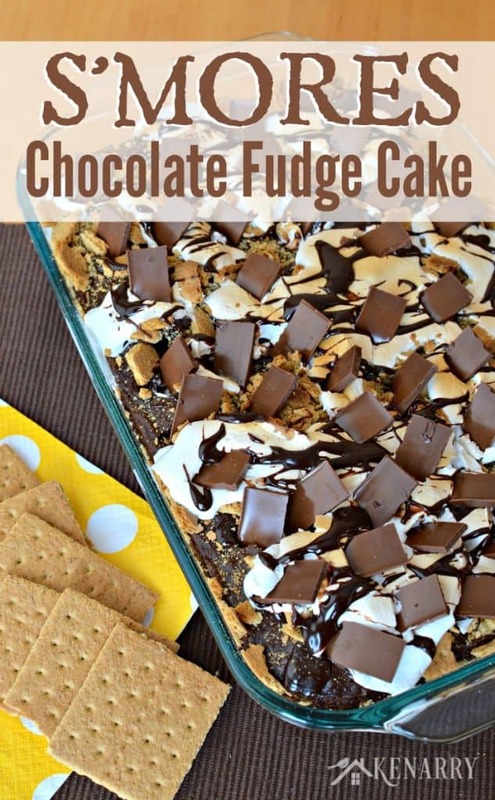 It was covered in toasted marshmallows, crushed graham crackers and rich chocolate. I just knew I had to try making my own version as an entire 9 x 13″ cake when we celebrated my mother’s birthday that year. She has a summer birthday and what says summer more than s’mores and campfires? Why wait until summer, though, to enjoy s’mores?! 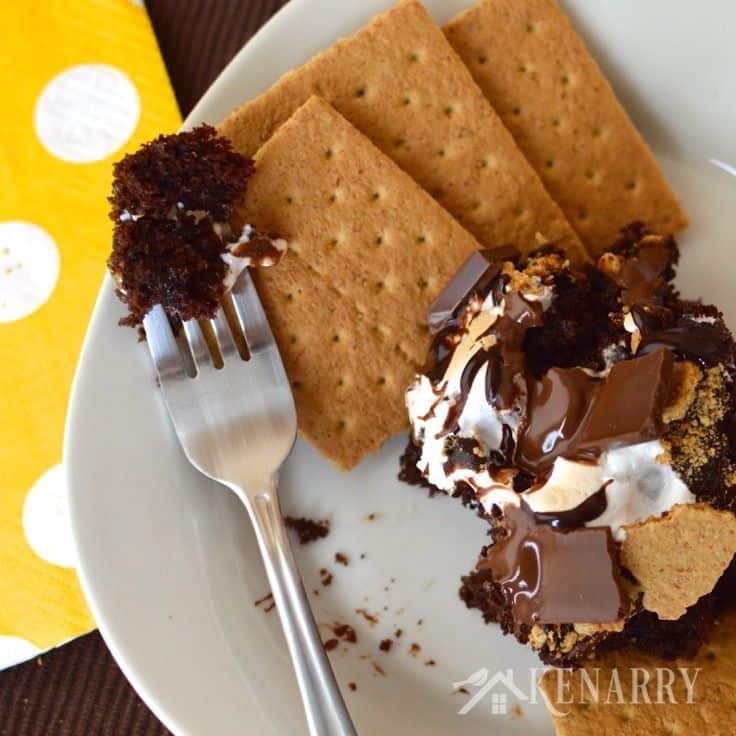 This delicious S’mores Chocolate Fudge Cake is like having gooey toasted marshmallow s’mores by a roaring campfire to bring a little warmth and good cheer to what can otherwise be a cold dreary season. 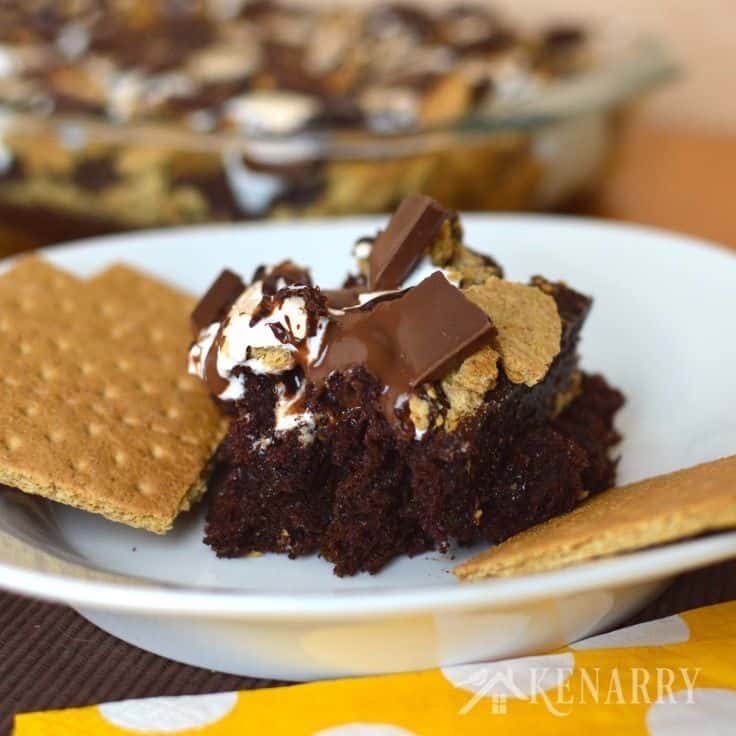 S’mores Chocolate Fudge Cake is made with graham crackers, toasted marshmallow, and melted chocolate bars. it’s like having your favorite summer-time treat any time of the year. This S’more Chocolate Fudge Cake is best served warm. Pair it with cold vanilla ice cream, if you’re celebrating a birthday. Candles and party hats are optional. I served this S’mores Chocolate Fudge Cake to my Bible study group the day after I made it, though, and they seemed to enjoy it just as well at room temperature. What’s your favorite birthday cake or dessert? Do you have a standard one you enjoy every year or do you prefer to try new desserts for your birthdays? Please comment below and share. Ashlyn and I would love to hear about your traditions and are always looking for new ideas. 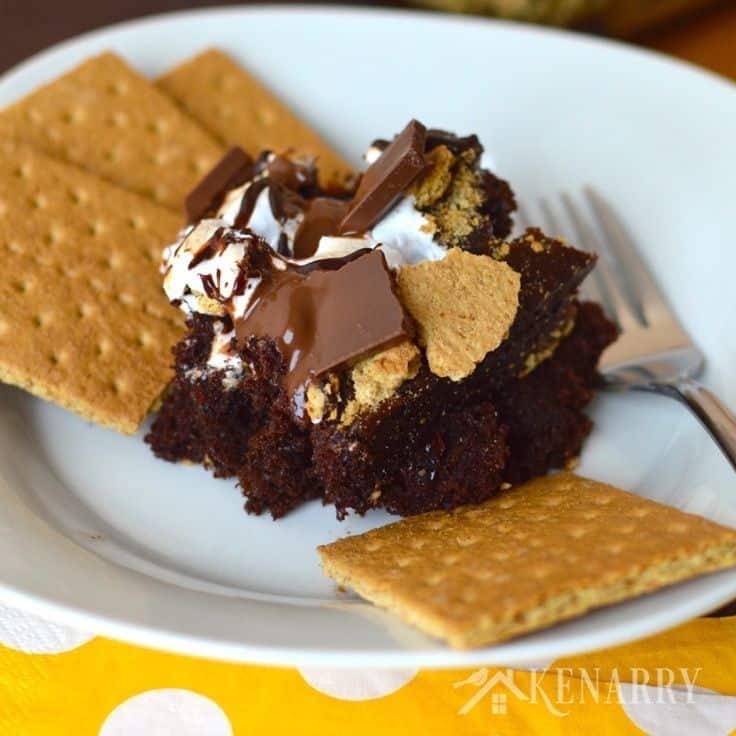 A big thanks to Ashlyn for allowing me to share this S’mores Chocolate Fudge Cake recipe today. I look forward to coming back next month to share more Ideas for the Kitchen with you. This is such a cute idea! It reminds me of summer but I love that I can make this when the weather is still cold! OMG, this looks amazing! Love the flavors of S’mores. Well done!